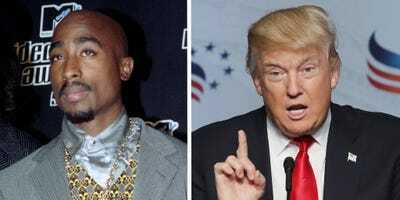 Mark Segar/Reuters; Mark Wilson/GettyTupac Shakur and Donald Trump. In the eight-minute interview — which was the rapper’s “first MTV interview as a solo artist,” according to the video — Shakur contrasts his underprivileged upbringing with the privileged world of “family heirlooms” and capitalist empires. “You want to be successful — you want to be like Trump? Gimme, gimme, gimme. Push, push, push. Step, step, step. Crush, crush, crush. That’s how it all is. Nobody ever stops,” Shakur said, describing what he sees as the selfish forces of capitalism. According to The Hollywood Reporter, MTV was “unable to confirm whether the video ever aired” on the channel.